Seattle, Wash., January 23, 2018	(Newswire.com) - Catering to an urgent need to fulfill increased commitments, XS CAD has recently doubled the size of its MEP engineering design team to 16 design team members at its offshore MEP Design office in Mumbai, India. Started in August 2015, the design engineering team has seen a period of steady growth due to increased demand from existing as well as new customers. Continued supply shortages of skilled engineers in domestic markets in Australia, the UK and US, coupled with the construction industry’s increasing demand for smarter and more sustainable engineering solutions, created by experienced mechanical, hydraulic/plumbing and electrical engineers, has led to the recent growth at XS CAD. With a team of senior mechanical engineers, senior electrical engineers, plumbing/hydraulic and fire engineers, XS CAD already provides mechanical design, electrical design, public health design and fire protection design services and has recently added two more services, i.e. computation fluid design (CFD) and sustainable design, to better serve our growing clientele. Team members are adept in a range of software platforms, including FirstRate5, Rhino, DesignBuilder, FDS and PyroSim. 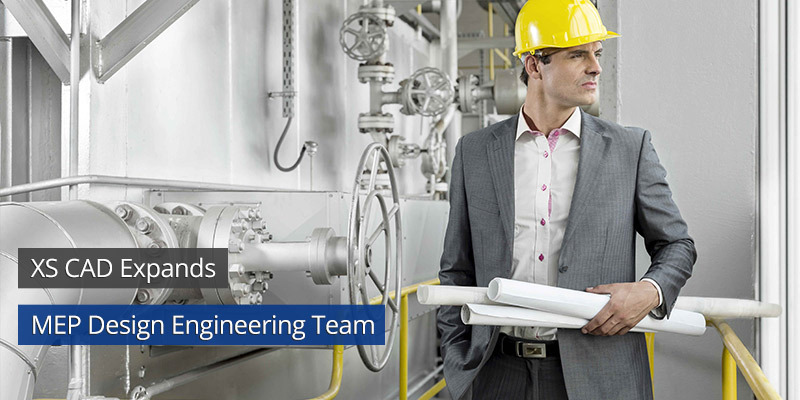 Dedicated offshore teams for MEP design consultants are provided by XS CAD for customers in the US, UK, Canada and Australia. The design team is supported by XS CAD’s MEP BIM team, ensuring that deliverables are provided in Revit MEP format. You can find more information about our MEP Design Services & Offshore BIM Team on our website. XS CAD is an AEC (architecture, engineering and construction) design and consulting firm focused on design, pre-construction, BIM (Building Information Modelling), VDC (Virtual Design and Construction) and DfMA (Design for Manufacture and Assembly) services for architects, engineers, contractors, manufacturers, retailers and homebuilders. We assist these firms during design, detailing and documentation stages, using the latest design software and CAD technology to create our output. We also utilize a range of online collaboration tools and interfaces to share our work with customers, ensuring transparency of our output within the context of our customer’s design workflows. The company is ISO 9001:2015 quality certified and a program partner of Autodesk’s Developer Network. XS CAD, a provider of pre-construction, 3D & BIM solutions to clients worldwide, since 2002. We have a UK-head office with our subsidiary and delivery centre in Asia that is ISO 9001:2015 quality-certified.